Tyler Hoog likes to say that when he first came to USC, he was greeted with hugs before handshakes. That’s because dozens of people already knew his story. They knew about his athletic prowess as a teen. They knew about the automobile accident that robbed him of his ability to swing a baseball bat or field a ground ball. And they knew about his quick wit, talent for writing and resolve in the face of tragedy. 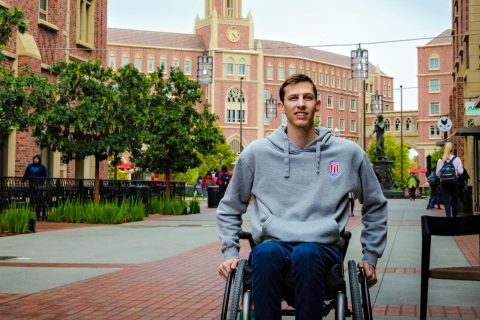 That instant familiarity is a built-in benefit of Swim With Mike, the USC scholarship program that supports student-athletes with physical disabilities. For Hoog, the community of volunteers, staff members and supporters provided a steady source of comfort and encouragement during his undergraduate years at the University of North Carolina at Chapel Hill and now as a master’s student at the USC School of Cinematic Arts. 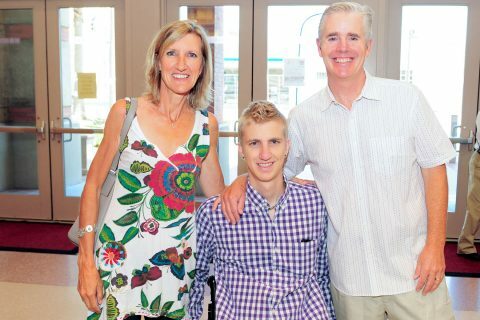 Now in its 39th year, the scholarship initiative started as a swim-a-thon fundraiser for All-American USC swimmer Mike Nyeholt after he was paralyzed in a motorcycle accident. 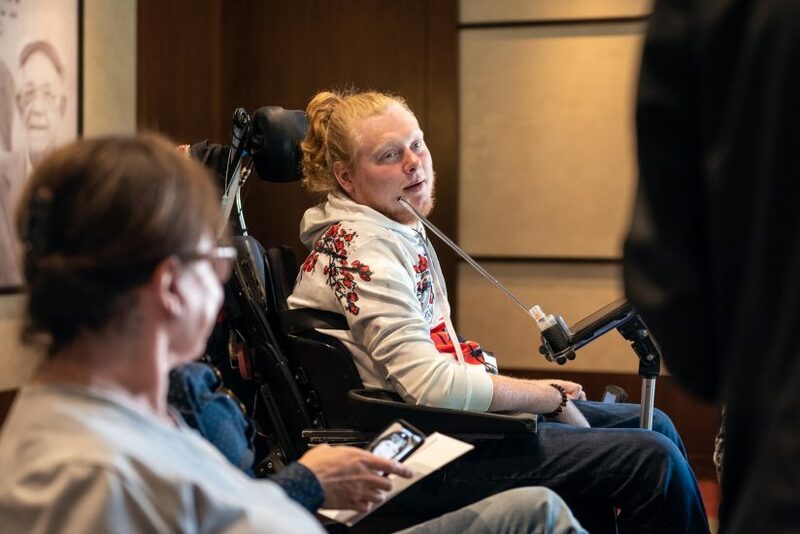 The event brought in more cash than he needed to buy an accessible van, so he proposed funding scholarships at USC for others facing similar circumstances. For nearly four decades, Swim With Mike has pursued its mission of providing financial resources to support the advanced education of physically challenged athletes to overcome their tragedies and realize their full potential. The program has since grown into an annual gathering at the USC Uytengsu Aquatics Center, along with a handful of satellite fundraisers around the country. 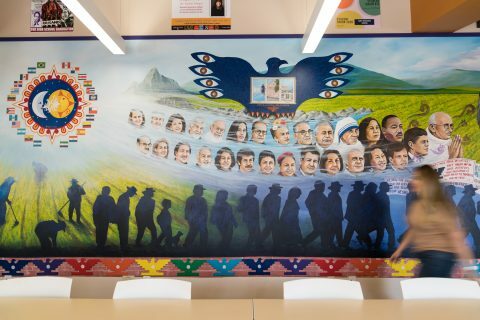 Millions have been raised through the years, benefiting hundreds of students and creating a community of avid supporters. 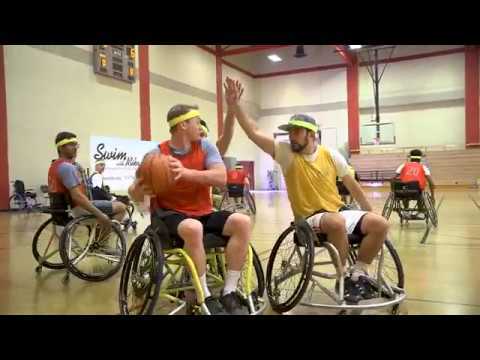 This year’s fundraiser gets started Friday at noon with a wheelchair basketball tournament at the Lyon Center. The festivities continue on Saturday with a pancake breakfast, silent auction, football showcase, diving competition, photos with Traveler, barbecue lunch, Trojan Marching Band performance and much more. It will be Hoog’s last fundraiser as a college student after six years of scholarship support from Swim With Mike. The native of Longmont, Colo., graduates this spring with a master’s in writing for screen and television. But he’ll be back for future Swim With Mike events. He doesn’t expect to be too far away, given his plans to land a writing job in Hollywood. And he wants to make sure others have the same opportunities he had. With slender silver stylus tucked into his mouth, Hoog deftly taps away on his tablet computer. He’s in the midst of revising an original film script he wrote for his thesis project. Titled 60, Alone, and Dying, the story follows Charlie, an introverted and isolated video game enthusiast. Hoog describes how the aging protagonist withdraws further into his world of gaming after a diagnosis of pancreatic cancer, until a brash new coworker inserts herself into his life. She pushes him to come out of his shell and reconnect with his estranged daughter. The project is a bit of a departure for the 24-year-old writer, who prefers comedy infused with hints of drama rather than the other way around. 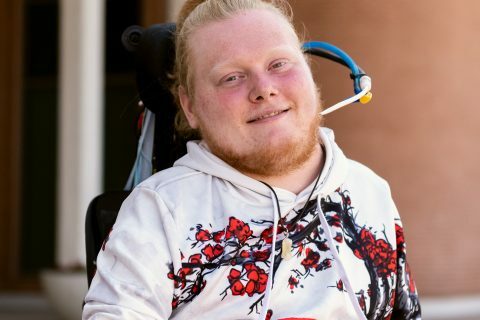 He summarizes another recent script that captures the adventures of two high school friends — one a paraplegic — dealing with the zombie apocalypse as Superbad meets Shaun of the Dead. Although he’s focused on writing, Hoog is also learning other skills like directing and producing. That will undoubtedly provide useful as he pursues a career in entertainment, with visions of running his own television show one day. Hoog found his passion for screenwriting in the wake of an off-roading accident at age 17 that damaged his C4 and C5 vertebrae. Despite the difficult years of recovery that followed, he frames the experience positively, noting it led to the discovery of his writing talents. I found my group of incredibly dorky film nerds, and it’s all because of Swim With Mike and a little bit of luck. Having spent time with Hoog over the past few years, Nyeholt said he is impressed by his determination and drive to overcome adversity. Seeing Hoog and other USC scholarship recipients succeed is also a humbling experience for Ron Orr, founder and executive director of Swim With Mike and senior associate athletic director at USC. He’s gratified to see support for the program grow each year, especially because it means more students will benefit. Although he has been running the program alongside Nyeholt since its inception, Orr is still astonished by its impact on scholarship recipients. The financial support is a big help, he said, but it pales in comparison to the boost to their self-esteem. And although many students who receive Swim With Mike scholarships come to USC, dozens of recipients attend other universities around the United States. In fact, many of the students currently on scholarship are enrolled in other institutions. The annual USC event gives students with disabilities an opportunity to compete in organized sports.